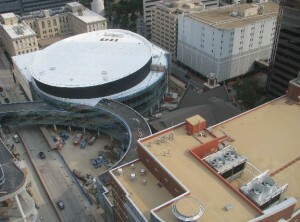 Dallas, Texas – First Baptist Dallas has unveiled the newly-constructed seven-level Horner Parking Garage. It is the first structure to be completed by Manhattan Construction Co. on the organization’s $123 million new campus development located in the heart of downtown Dallas. The garage will provide over 500 parking spaces to church parishioners and guests. “We are grateful to Manhattan Construction for helping us reach this milestone event as we move toward the opening of our new campus on Easter Sunday, 2013. First-time guests to First Baptist will enjoy how easy it is to park and access our new campus through the Horner Garage,” said First Baptist senior pastor Dr. Robert Jeffress. Ribbon cutting ceremonies for Horner Parking Garage were held on Sunday, April 29th and included the placement of a time capsule in front of the northeast entry to the new Worship Center. The capsule is scheduled to be opened in 2068 on First Baptist Dallas’ 200th Anniversary. Manhattan Construction is less than a year away from completing work on the remaining structures on the First Baptist Church – New Campus project. In addition to the garage, the project includes a new 178,000-square-foot Worship Center that will hold 2,780 seats. The sanctuary includes a 98,513-square-foot new education building with 60 new classrooms, six nurseries, a 6,500-square-foot gymnasium and three designated worship spaces for different age groups. Work began in July, 2010. To date the Manhattan Construction team has recycled 98 percent of the construction and demolition debris. The First Baptist Church – New Campus development is LEED®-registered and the project team is seeking LEED Silver certification. LEED, or Leadership in Energy and Environmental Design, is an internationally-recognized green building certification system developed by the U.S. Green Building Council. Founded in 1896, Manhattan Construction is consistently recognized nationally by Engineering News-Record among the top 20 general builders. Manhattan operates from offices in Tulsa and Oklahoma City, Okla.; Dallas and Houston, Texas; Naples, Fort Myers, Sarasota, Kissimmee, Fla.; Washington, D.C.; and Atlanta, Ga. Manhattan’s building portfolio includes corporate headquarters, institutional, healthcare, office, hospitality and leisure, sports and entertainment, aviation, retail, and judicial facilities throughout the United States, Mexico, Central America and the Caribbean. Manhattan has been in Houston since 1942. For more information visit: www.manhattanconstruction.com. You are currently browsing the Manhattan Construction Group blog archives for April, 2012.